Check out this great photo of Layne Staley, Kat Bjelland, Les Claypool and Maynard James Keenan hanging out at Lollapalooza 1993 where all of their bands Alice in Chains, Babes in Toyland, Primus and Tool all performed. 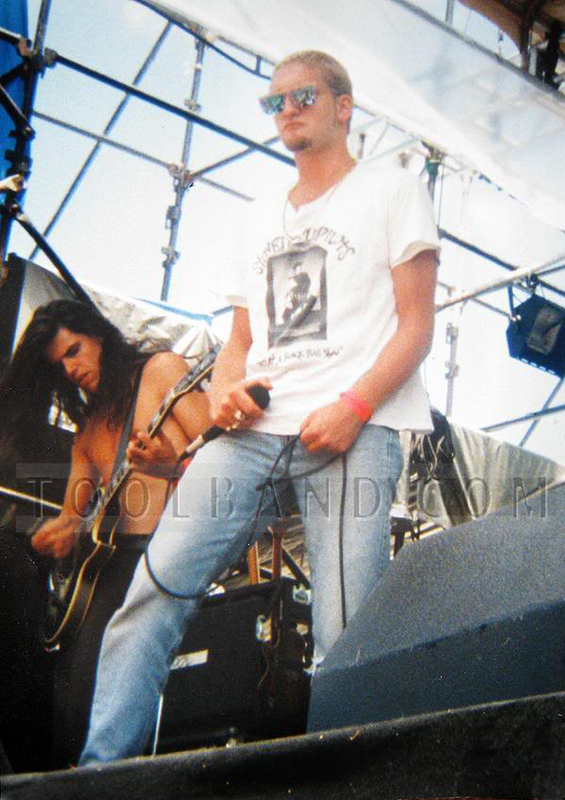 During the Lollapalooza Tour there were a few momentous occasions in Houston (July 31, 1993) and Dallas, Texas (August 1, 1993) that Staley jumped on-stage with Tool to perform “Opiate”. The video of those performances are not available online. Luckily one of Staley’s Tool performances was captured on film at the Big Melee Music Festival in Kuualoa Ranch, Hawaii, August 15, 1993. The last time Staley sang with Tool was at their concert at Bremerton, WA on May 28, 1994. Click below to check out the story behind “Arizona Bay”.